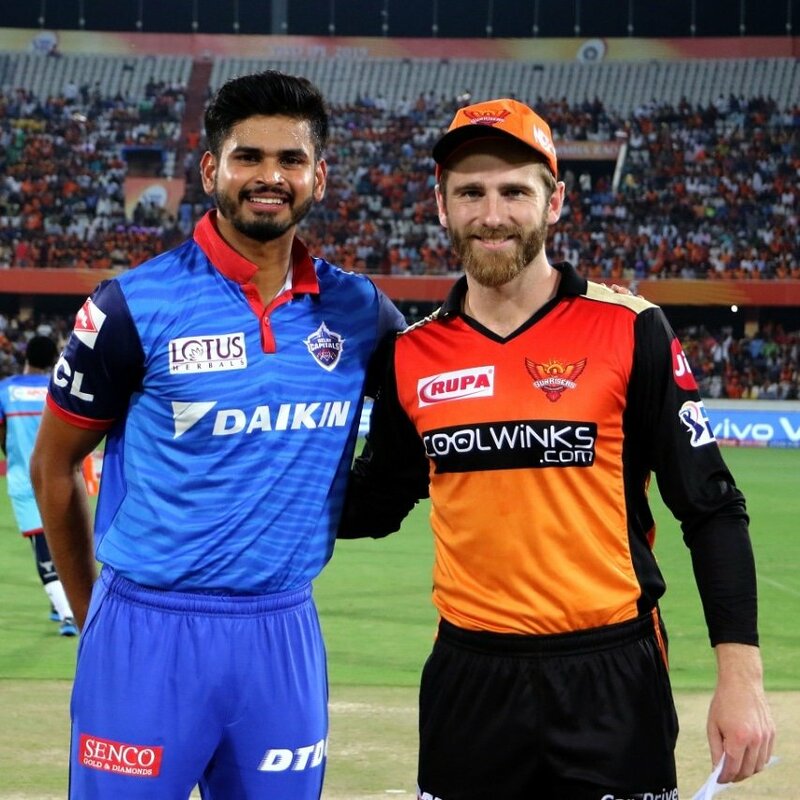 The Sunrisers included Abhishek Sharma, Ricky Bhui, Khaleel Ahmed and regular skipper Kane Williamson in place of Manish Pandey, Yusuf Pathan Siddharth Kaul and Mohammed Nabi, while Capitals included Ami Mishra and Colin Munro in place of Rahul Tewatia and Colin Ingram. After being sent in by Hyderabad, Khaleel Ahmed playing his first match of the tournament, dismissed Prithvi Shaw and Shikhar Dhawan cheaply. Munro along with skipper Shreyas Iyer added 49 runs for the third wicket, before Abhishek Sharma dismissed the former for a quick fire 40. Iyer and dashing wicket keeper Rishabh Pant were involved in a valuable 56 run stand for the fourth wicket, before both the well set batsman fell in quick succession for 45 & 23 to Bhuvneshwar Kumar and left arm fast bowler Khaleel respectively. Axar Patel scored a handy 14 at the end, as Delhi capitals posted a competitive score of 155/7 in their allotted 20 overs. The 21 year old Khaleel was Sunrisers best bowler as he claimed 3/20, while Kumar bagged 2 wickets. Chasing 156, Sunrisers ever reliable opening pair of David Warner and Jonny Bairstow started brilliantly by adding 72 runs for the opening wicket, before Keemo Paul got the dangerous Bairstow for 41. Two over later skipper Williamson was caught brilliantly by Kagiso Rabada. Ricky Bhui who was surprisingly promoted ahead of Vijay Shankar failed to get going as he departed quickly. David Warner brought up his fourth fifty of the IPL 2019, before he was caught by skipper Iyer off Rabada. Delhi Capitals hopes of winning the match ended, when they lost Shankar in the very next delivery. Chris Morris in the 18th over claimed wickets of Deepak Hooda, Rashid Khan and Abhishek Sharma to put the visitors within touching distance of a famous win. The 23 year old South African fast bowler ended the Sunrisers run chase with 2 wickets in consecutive balls, as the home side were routed for 116 in 18.5 overs. Keemo Paul was declared the Player of the Match. The 31st Match of the Indian Premier League will be played between Mumbai Indians and Royal Challengers Bangalore at the Wankhede Stadium, Mumbai on 15 April Monday.